I thought I’d begin by introducing myself. My name is Lesley Smith (some of you know me already as Lesley from OZ) and I emigrated to Australia from England in 1970 to join my parents and siblings. I am the Secretary of the CGCAA (Carnival Glass Collectors Association of Australia) and my husband, Bob, is the Newsletter Editor. I first began collecting Carnival in 2002 – how things changed when I did! Now I cannot imagine my life without it. Initially I started collecting American makers, but as time went by my direction changed to Australian and European Carnival. The Australian Top Ten list below is based on my personal thoughts and rationale. Australian Carnival is highly sought after in Australia; “dark” pieces (purple and deep amethyst) are usually seen as more desirable than marigold, although there are a couple of exceptions. Prices remain fairly high if you judge by the bidding on eBay. It is hard to give figures from auctions as often there is very little on offer and because of that I am unable to provide values for many pieces (in such cases I have used the notation NP= No Price). Figures given are in Australian dollars. All the items listed in my Australian Top Ten were made by Crown Crystal (the only known Australian Carnival producer). In my list you will notice that sometimes I have grouped several patterns together. That’s because I feel they all deserve that specific number / ranking. No. 10 – Pattern 1021. This is illustrated in the Crown Crystal catalogue in clear glass. At the time of writing, there is only one known in “dark” black amethyst (it is in my collection); none are currently known in marigold. I consider this piece to be scarce, and it is not possible to “guesstimate” a price. NP. No. 9 – Trailing Flowers bowl in marigold, $175. Diamond Cut bowl in marigold, $100. Diamond Cut bowl in “dark,” $200 plus. No. 8 – Butterfly Bower small bowl in vaseline, no figures on how many currently known. NP. Butterfly Bower small bowl in “dark”, $150. No. 7 – Gumtips vase, Twisted in “dark”, $200 plus. 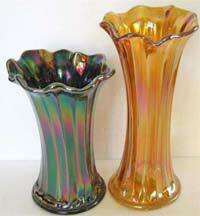 Gumtips vase, Twisted in marigold, up to $200. No. 6 – Lily vase “dark”, over $200. Lily vase in marigold up to $200. There are not many on the market so prices could go higher. No. 5 – Kookaburra master bowl in marigold, $200 plus. Kookaburra nappy in marigold, $150; Shrike and Magpie master bowls in “dark” have been known to go to $250 plus. No. 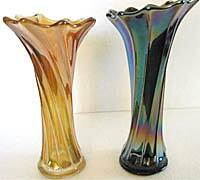 3 – Aqua base glass pieces are scarce and thus in any pattern (for example, Emu or Kangaroo) or any shape (for example, comports or bowls) they can fetch higher prices than their “dark” or marigold counterparts. NP. No. 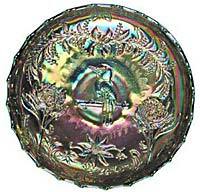 2 – Kookaburra float bowl in “dark” (regular and bullet edge) and marigold. Kookaburra ICS bowl in “dark.” Emu master bowl in “dark.” Emu comports (all shapes) in “dark.” All have been known to go between $1800 and $5000. Any Kiwi nappy bowls are hard to find. NP. No. 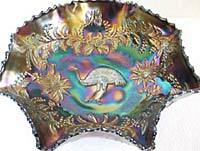 1 – Australian Holly deep nut bowl shape is very rare NP. The Kiwi dome based bowl in “dark” at a recent auction went for over $6000. Marigold master Kiwis also fetch a commanding price of $2000 upwards. It is said that the marigold is scarcer than the “dark,” but I have no firm confirmation on this. The Banded Diamond water set is not often found in any colour. NP. It is rumored that there is a Koala in someone’s collection here in Australia, but I have never seen one. As far as I’m aware, none of the CGCAA members has seen one either. If one should emerge it would be virtually priceless and scarcer than hens’ teeth. When one compares the volume of Carnival from America and Australia, many Australian pieces can be classed as scarce or rare. There are many patterns I have not mentioned which maybe should have made the Top Ten, but it was so hard to pick out the “best of the best.” I am unable to give figures on how many collectors in Australia own the pieces I have mentioned as there are many who do not belong to any clubs. Australian Carnival is unique to its native country. The flora and fauna motifs are often iconic and combine to make the patterns so appealing, while the simplicity of colors concentrates the eye on the often vivid and superb iridescence. My only regret is that I don’t own all the items listed in the Top Ten.